“We may wonder what is the greatest end of life. Men make their plans and try to adhere to them. Skagway, a port situated in a mountain pass, was developed and made notable in a rush of men seeking to acquire something of material value. There is a motive which is inherent in us, but the longer I live and the more I see of communities and human beings, the more firmly is my belief established that the sweetest thing in the world is the friendship of a few dependable friends. This is the happiness that makes a life of contentment. Shown above with his wife a few steps north of AB Hall before this speech. He passed away a few days later in San Francisco. This was perhaps the last speech he ever gave. From the Evening Independent July 12, 1923. “On April 11 at about 7:30 in the morning the air about me became oppressive with a distinct and uncommon silence. In my wanderings through different wilds I had become used to many strange freaks of nature, but this one appalled me. 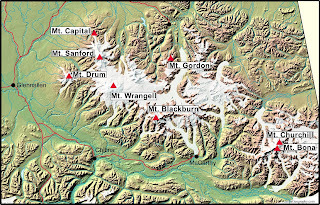 I was in a rough mountainous country, I should judge about 10 miles from the base of Mount Blackburn, in Southeastern Alaska, not far from the starting point of a glacier called Muir Glacier. Suddenly the earth beneath my foot shook, a low rumbling sound accompanied the quaking. I glanced up at Mount Blackburn. Instantly it seemed as though the peak had opened; a cloud of ashes and smoke shot out into the air several hundred feet, and then there seemed to flow from the opening in the top a stream of dirty stuff mixed with large and small boulders. This continued only for about ten minutes then ceased as suddenly as it had begun. 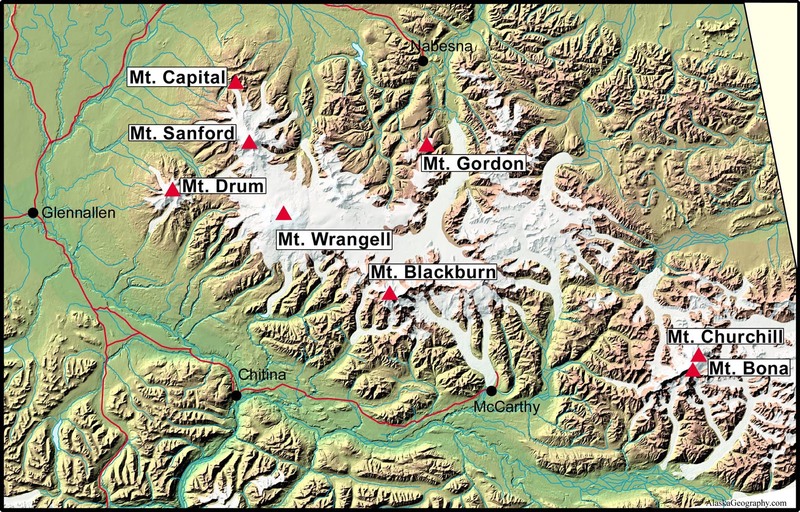 The official story is that the last time Mt Blackburn erupted was 3-5 million years ago. The 1902 incident was probably just a geologic burp. Marion Granger was born on February 4, 1866 in Calhoun, Wisconsin. When she was 35 she married Henry David Clark in Tacoma and they moved to Skagway to farm. A Clark child was born and died in 1902 who may have been their first child, but they then had two daughters, Floris in 1904 and Dorothy in 1910 who are often pictured in the fields of Clark Farm on postcards. 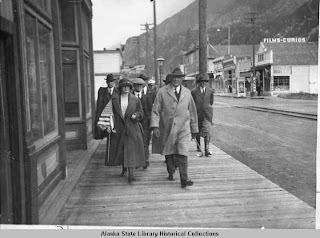 Henry first started potato farming in Dyea and later had a farm on the other side of the Skagway River where the Jewell Gardens are now. In the tea room are several enlarged photos of the family and the gardens. Marion was the treasurer of the Presbyterian Church for 26 years and died on this day, April 28, 1947 and is buried in the Pioneer Cemetery with Henry. 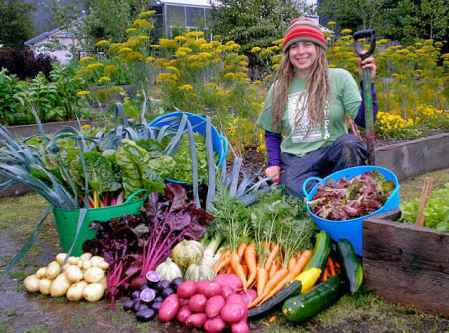 Above is picture of a modern gardener at Jewell Gardens with a bushel of organic vegetables! Last summer our family did the CSA with them and I plan to again – what a great program! It is so great to know that your food is free of pesticides and chemicals. Garden On! 1920 and 1929 Skagway census; Mills page 64; Skagway death record; 1880 census in Wisconsin; 1915 directory. The daughter of George Carmack and Kate Nadagaat Tlaa Kaachgaawaa Mason, Graphie was born on January 11, 1893 in Fort Selkirk, Yukon. 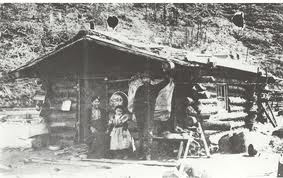 George met Kate at Healy’s Trading Post in Dyea and they were a common-law marriage until about 1900. That year George took Kate and Graphie to Holister, California to live with his sister. He went back to Dawson where he fell for Marguerite Saftig L’Aimee a large handsome woman who ran a cigar store. Now it was said at the time that Marguerite sold more than cigars, the men loved her. George took her to Olympia Washington where they were married in October 1900. He then took Graphie from her mother and the new family moved to Seattle with Marguerite’s brother, Jacob Saftig. Jacob, 33, fell for Graphie, 17 and she became pregnant. They married on June 30, 1910 and their first son, Ernest Charles Saftig was born three months later on October 7, 1910. Later, Graphie remarried someone named Rogers because she died as Mrs. Graphie G. Rogers on March 25, 1963 in California, either in Lodi or Los Angeles. She was 70. I had a visitor come to my desk last summer who claimed her grandfather was G.W. Carmack, son of George Carmack and that he died in Poteau, Oklahoma but could not give me any further information, so perhaps George had other kids from either Kate or Marguerite. There has been alot of interest in George Washington Carmack with the release of Howard Blum’s book, Floor of Heaven. It is a fun read if you haven’t read anything else on the story, but the footnotes are a little vague, in my opinion. But what do I know…seen above is a cabin with George, Kate and Graphie in happy times. WA state records; California death index; SS death index.Canadianmysteries.ca; Johnson; Thornton; Kitty Smith oral history:Life Lived Like a story; WA 1910 census;1901 Carcross census;Polk County News, Dec 20, 1923. Mr. Newell was born on this day, April 26, 1868 in Albany, New York and graduated from Yale where he played on the Football Team in 1888, seen above. 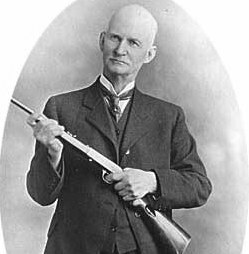 He was involved with railroad administration and started work at the White Pass & Yukon Route in 1901 as the Vice-President. It seems as though his position was based in Seattle as there was some controversy of White Pass closing their Victoria and Seattle offices in 1902 and moving them to Vancouver. His socialite wife apparently stayed in Chicago and occasionally visited the far Northwest before returning to civilization. He visited Dawson with President Graves in 1903 but received an icy welcome from Yukoners because of some White Pass administrative polices. Anyway, by 1912, Ashbel had moved on to be President of the Tennessee Central Railroad. 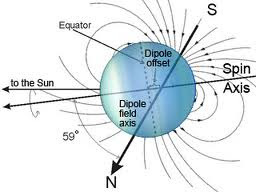 In 1903 Professor Samuel Jackson Barnett of Stanford University stated that his extensive studies with USGS on the coast in the Skagway area determined that there is a magnetic pole here! Hmmm, a perfect vortex of inestimable value! There was an ad for Dr. Boetzkes in a Skagway Newspaper in 1898 so we know he was here. The funny thing is that a few months earlier, on June 20, 1897, he had taken a rifle and tried to kill his wife, Helen, and his 4 kids(Clara, Anna, Harry, Walter) in the delightful community of Bensonhurst-by-the-sea. If you read the entire article online, it seems that he was sick with a cold and had been taking stimulants [???!!!] anyway, his lawyer, one Felix McCloskey (hopefully no relation) said he was ill and not responsible for his actions. On July 10, 1897 he failed to show for trial and so his friends forfeited the $500 bail but apparently were happy to see him go. In 1898 he was also being sued for negligence. So, he went to Seattle where he got into a fight with Mayor Woods “his pugnacious spirit had effervesced” and so, then he set out for the Klondike. Skagway would be like a great place for a gun-happy, incompetent doctor, I wonder where he went from here? Perhaps he got together with his wife in Washington, the Washington records show a Dr. Boetzkes dying in 1902 but the age is wrong. The 1910 census in Seattle definitely shows Helen his wife as a widow, and in 1926 she dies at the age of 73, also in Seattle. Ny times articles of June 21 and August 26, 1897. Report of Cases Vol 26, New York Supreme Court. Washington census and death records. Today marks the 43rd year that local folks of Skagway showed up in their grubby clothes and extra-toughs to pick up trash bags for project Clean Sweep. I don’t know how many people helped today, but there was certainly a great showing given the fact it was cool and blowing. Although earlier this spring the Chamber of Commerce seemed to be on the ropes, the good directors and members pulled off a great luncheon too. Reed and I decided to clean Pullen Creek by the Peniel Mission. After the devastation of the “hazard tree removal” action last fall, most of the slash and brush had accumulated in the tiny creek. Plastic bags, pieces of cardboard, aluminum cans, one petrified coconut, and even an ancient car battery were also caught up. We noted some new bear poop and we talked to a few visitors from Whitehorse who came down for the long weekend. We took naps after the luncheon, and I’m now eating the leftover cupcakes I made for the event. Wish you were here to share one! Louis Alphonse Pare was one of the doctors assigned to treat the members of the NWMP in the Yukon. He was born in Lachine, Quebec in 1848 and was appointed assistant surgeon for the NWMP in 1887. In November 1898 he was sent to Tagish Post where he arrived on December 20, 1898. The post had been without a doctor for a year. Several men were laid up with or recovering from typhoid. 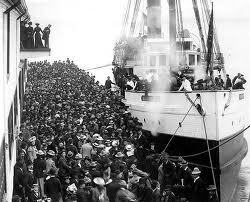 Some were sent to Bennett or Skagway to be sent to Victoria. During his first year at Tagish, he treated 274 cases ranging from typhoid to scurvy and frozen-amputated limbs. 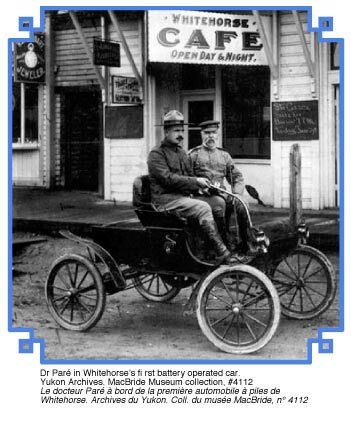 Dr. Pare stayed on in the Yukon until his retirement in 1911, being promoted to full surgeon in 1904. Seen above in Whitehorse in the first electric car. Hmmm, way ahead of his time!